Stepping Stones Agencies is so grateful for the many generous individuals, businesses, and groups committed to ending all forms of violence and abuse in our community. 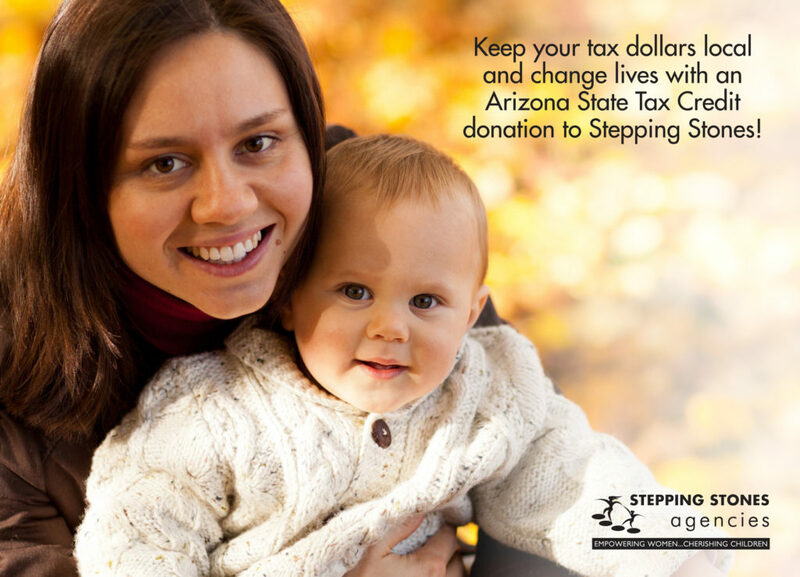 There are many ways for you to get involved and support local families with Stepping Stones. Whether you want to give financially or donate items to our shelter and thrift stores, each donation is helping local families escape abuse. Yet, regardless of which form it’s in, we are so grateful for your support and partnership. All donations stay here in West Yavapai County and help families LOCALLY. 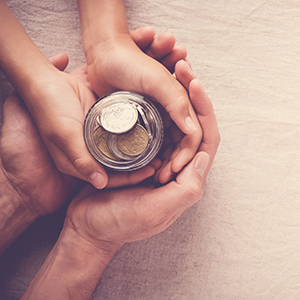 Arizona State Charitable Tax Credit keeps your tax dollars in the Prescott area supporting local families when you make a donation to Stepping Stones. Make a difference in your community and redirect your tax dollars! This dollar-for-dollar tax credit allows you to redirect your tax dollars to help end abuse in our community! Donate now below or click here to learn more about the Charitable Tax Credit. 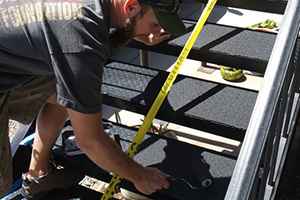 Stepping Stones’ official Qualifying Charitable Tax Credit code from the State of Arizona is: 20034. Please keep this code for use on your tax documents. Stepping Stones Agencies is a not-for-profit 501(c)3 tax-exempt organization. Check with your tax professional for information regarding donations. At Stepping Stones, we are driven to end violence and abuse in all forms in our community. Your donation helps families say NO MORE to victimization through our 24/7/365 Helpline, safe shelter, and advocacy services. 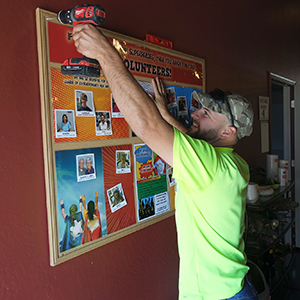 Donations always stay local and serve those living right here in West Yavapai County. Click the Paypal button below to make a one time or reoccurring monthly donation. 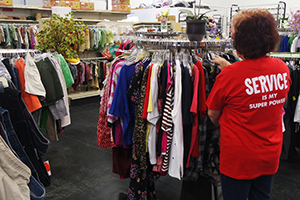 Adults and children who come to Stepping Stones are able to shop for their clothing needs at our thrift stores, yet we occasionally do need specific items. Call Cori at 928.772.4184 to learn about any specialty items we may need in our shelter or if you would like to donate during the holiday season. All shelter donations can be dropped off at Stepping Stones Administration Office at 6719 E. 2nd Street in Prescott Valley. Donating to our thrift stores is a perfect way to say goodbye to treasures you no longer need! If you have questions about what donations we are able to accept, please give us a call at one or our thrift store locations to learn more. Click here for hours, locations, and more about Stepping Stones Thrift. 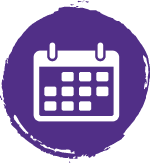 Help make sure that Stepping Stones’ commitment to 24/7/365 safe shelter and advocacy services continue to be available to our local communities for years to come. Contact Robin at 928.772.4184 for a personal discussion about your legacy possibilities. BE A PART OF OUR VOLUNTEER TEAM TODAY! Give back and support local families with Stepping Stones volunteer opportunities! Learn about available positions and make an appointment to meet with our Volunteer Coordinator today. You choose your hours, location, and position! Perfect for students, retirees, those looking for work experience, or anyone wanting to support local families! For more information, contact Jesus at 928.772.4184 or by email volunteer@steppingstonesaz.org. * Shelter Volunteer Opportunities Available – Based On Specific Skill Set. Volunteers are vital to the success of our Stepping Stones social enterprises and services and are always needed at all of our locations. 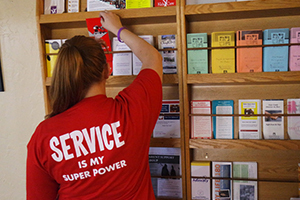 Volunteer Positions are available at our Thrift Stores, Step One Coffee House & Specialty Bookstore, Administrative Office, and Step One Community Centers. Additionally, we have AMAZING people volunteering in our emergency shelter, transitional living program, and on our Help Line. However, the guidelines for volunteering in our advocacy program are a bit more rigid than at our other locations. Fingerprint clearance, background checks, CPR/First Aid training, and a 52-hour orientation/training program must be completed before you can begin. However, we are always looking for people who are the right fit to help provide these services for our community. If that is something you’re interested in, please print and complete the Volunteer Application below. Contact Jesus at 928.772.4184 or by email volunteer@steppingstonesaz.org for more information about all volunteer opportunities. Employment Opportunities: We often have openings at our various social enterprises and with our social service programs. Volunteers who are already familiar with our programs and who have already been trained get priority placement when openings become available. However, occasionally there is an opening for someone with a specialized skill set. Please feel free to email your resume at any time to Denise@SteppingStonesAZ.org or you can call our Administrative Office at 928.772.4184 to inquire about specific openings. We are lucky to have such a great, committed team, but because of this, very few new employment opportunities become available. 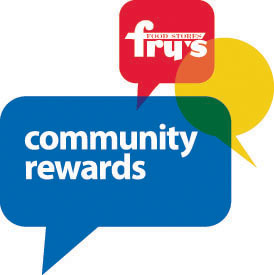 You can shop at Fry’s Food Stores and support Stepping Stones at the same time through the Community Rewards Program – simply by doing your regular shopping! Once you’re signed up, simply swipe your current Fry’s VIP Rewards Card and Stepping Stones will earn a small percentage of that purchase. Below are step-by-step instructions on how to easily register for this program. If you have any questions or need any assistance with this, please call our Administrative Office at 928.772.4184, and we’ll be happy to help you out. Click “Enroll Now” at the bottom of the page. You will need to either log-in to your current Fry’s account or register for a new one (that process will include gathering basic contact information and entering your current Fry’s VIP card number). After signing into or creating your account, you’ll be prompted to enter the organization of your choosing. Stepping Stones’ Organization Number is HN881. That search should populate STEPPING STONES FOUNDATION, INC. Select it and click “Enroll”. You should be directed to your Account Profile page, where a message confirms your enrollment. At the bottom of your account page, you should see Stepping Stones listed under the Community Rewards section. If you have any questions about this process, please give us a call and we’ll be happy to help. And thank you for continuing to help support Stepping Stones and keep emergency services available for women and children in this community. Where it says “Or pick your own charitable organization:” enter “Be Better Foundation Inc Prescott Vly” for the listing for Stepping Stones Agencies’ shelter. Note: Always check that the Be Better Foundation listing you choose is in Prescott Valley, AZ! Shop! No further action is required, and all the same items/prices are available. When you complete your checkout, 0.5% of your total purchase will automatically be donated to Stepping Stones. 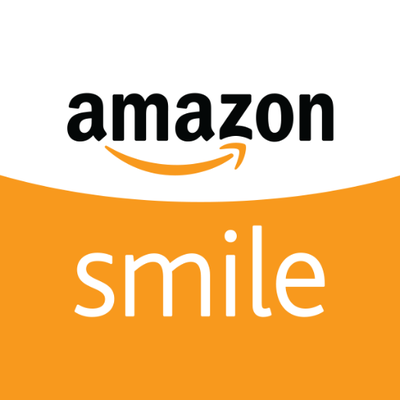 Make sure you always shop from smile.amazon.com in order to ensure you are donating each time you shop! Note: Stepping Stones does not obtain any personal information or details, including information on your order(s).